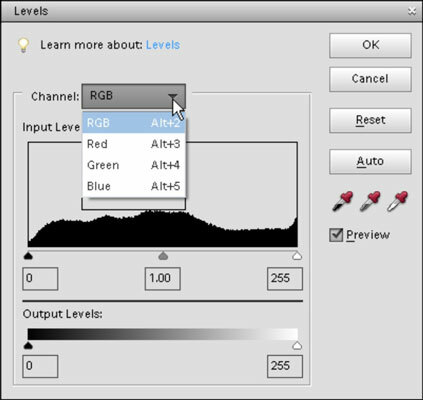 Your first level of color mastery in Photoshop Elements 11 is to understand what RGB is and how it comes about. RGB stands for red, green, and blue. These are the primary colors in the computer world. Forget about what you know about primary colors in an analog world; computers see primary colors as RGB. RGB color is divided into color channels. Although you can’t see the individual channels in Elements, you still need to get a handle on color channels. When you see a color pixel (a tiny, square dot), the color is represented as different levels of gray in each channel. When you have a color channel, such as the red channel, and you let all light pass through the channel, you end up with a bright red. If you screen that light a little with a gray filter, you let less light pass through, thereby diluting the red color. That’s how channels work — individually, they all use different levels of gray that permit up to 256 different levels of light to pass through them. When you change the intensity of light in the different channels, you ultimately change the color. Each channel can have up to 256 levels of gray that mask out light. You can calculate the total number of possible colors that you can create in an RGB model by multiplying the values for each channel (256 x 256 x 256). The result is more than 16.7 million; that’s the total number of colors a computer monitor can display in RGB color. This is all well and good as far as theory goes, but what does that mean in practical terms? Actually, you see some of this information in tools and dialog boxes you work with in Elements. As an experiment, open a file in Elements and choose Enhance→Adjust Lighting→Levels (or press Ctrl+L/Command+L); the Levels dialog box opens. The Channel drop-down list shows you Red, Green, and Blue as individual channels, as well as a composite RGB selection. Furthermore, the Output Levels area shows you values ranging from 0 on the left to 255 on the right. Considering that 0 is a number, you have a total of 256 different levels of gray. What’s important is that you know that your work in color is related to RGB images that make up three different channels. Each channel can let 256 different levels of gray through — that is, hold back different amounts of light — to change brightness values and color.